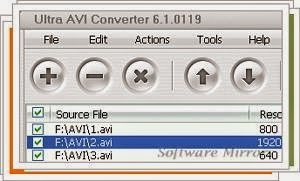 Ultra AVI Converter is a multimedia software which allows you to convert all of your AVI, DivX video files, and Xvid to AVI, MPEG, ASF, VCD, SVCD, DVD, FLV or WMV. Ultra AVI Converter comes with a simple and very easy to use interface. Featuring big, clear buttons, it has a clear and pleasing interface that greatly facilitates its use compared to other similar programs. Adding media file in Ultra AVI Converter can be done by file browser or "drag and drop" function. Ultra AVI Converter also supports batch processing and provides tools to cut parts of video that do not interest you. Ergonomic, fast and efficient. Too bad the trial version limits the conversion to 50% of the file.